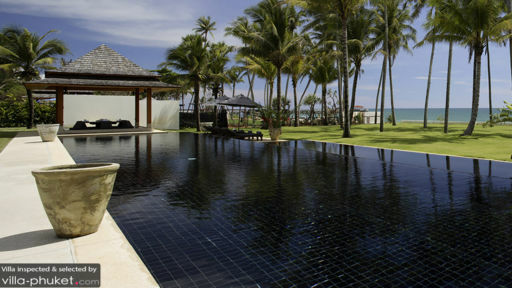 Villa Shanti is found on Phuket’s serene Natai beach, one of the most popular beachfront locations in the area. 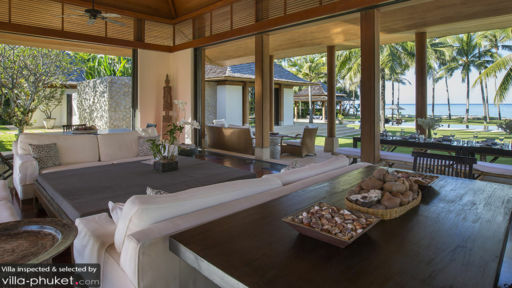 The stunning traditionally-Thai beach property features five lavish, and open-plan pavilions, housing the living/dining rooms, kitchen, and six bedrooms. A luxurious and stunning black-tiled infinity pool resides amidst lush tropical foliage overlooking the Andaman sea. For a soulful holiday, Villa Shanti is the perfect choice with its homely ambiance, excellent facilities, and even better staff who will treat you like family. The last two of the five pavilions at Villa Shanti are found on either side of the ‘Great Room’, and there are three bedrooms in each of these pavilions. There are two master bedrooms at the villa, each furnished with four-poster, king-sized beds draped with sheer, white drapes for a comfortable night’s rest. There is a study in each of these bedrooms and they open to the garden and pool through sliding, glass doors. Two of the four guest bedrooms are furnished with teak wood, four-poster bedrooms and are air-conditioned. These too have study areas and large glass windows that slide open to allow the fresh air to ventilate the room, along with providing splendid views. The last two bedrooms are furnished with twin-beds and a study area for a workspace. There are large, French doors that lead outdoors, and the air-conditioned bedrooms are spacious and comfortable. Each of the six bedrooms has an en-suite bathroom that are partially, open-air, and the four bigger bathrooms are ‘garden’ bathrooms! It is not only the 25-metre swimming pool that will enrapture you, however, it is the beach frontage with its sandy shores, dazzling waters, and the endless views that are sure to make your heart skip a beat. As you lounge on the sunbeds that have been placed on the pool deck facing the beach and the Andaman Sea, the tranquillity and peaceful atmosphere will engulf you wholeheartedly. The coconut and palm trees sway suggestively above you, casting an enchanting shadow on the luscious gardens, under which you can indulge in a glorious nap. A hidden sala is completely tucked away in its private corner, with a daybed and an enviable view of the sea. At the heart of Villa shanti, resides the ‘Great Room’, essentially the living and dining pavilion, of the five individual pavilions at the villa. The beautiful space is instantly relaxing to your mind and body with its open-plan structure wherein you can get an eyeful of the lovely gardens and the Andaman Sea. Gorgeous Thai interiors include wooden floors, antique statuettes, white sofas, ottomans, and a collection of rocks and shells. Just outside is the dining pavilion, for an alfresco experience with a lavishly, set dining table against a mesmerizing backdrop. The family room is another living area with a comfortable sitting space along with a flat-screen TV and books for you to read! This is a cosy nookkitchen is found in a third pavilion and is fully-equipped featuring state-of-the-art facilities and amenities, for your use! With a villa manager to oversee the smooth functioning of the villa, there is nothing for you to worry about. Housekeeping and security is well-taken care of, and as for additional requests like the villa offers an extensive spa facility with several therapies and treatments for guests. Car rentals can be arranged for if you wish to go on excursions or explore the neighbouring areas. 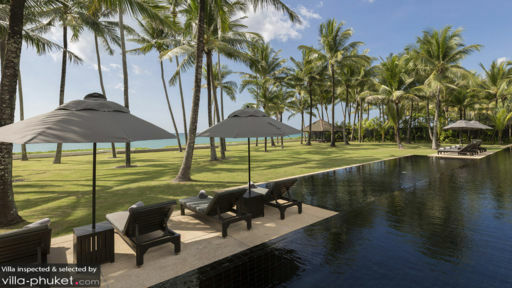 Found on the sandy shores of Natai beach, Villa Shanti provides guests a coveted chance to unwind and rejuvenate surrounded by absolute tranquillity and no disturbances. The entire stretch of beach is home to some of the most luxurious holiday resorts, lovingly termed the ‘Millionaire’s Row’, where you can even spot private yachts owned by some of the villa owners.